So here's the story, dad and mom came in for New Year's weekend. So Dad wouldn't get bored Bill had to work hard (after the trip to Cabela's on Saturday). They worked Saturday and Sunday finishing the beam in the basement. 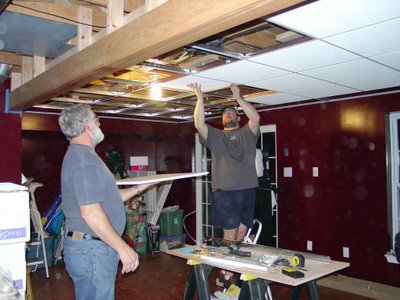 They then started on the drop ceiling frame. On Monday morning, Mary and I took an interesting trip to Home Depot to get the ceiling tiles. Our trip to Strawbridges was just as interesting but has nothing to do with the basement. So ask us later. After eating lunch, I had Bill and Dad get the ceiling tiles out of the van. So after they got them all in Bill's back felt like it was going to give out. So there was probably about a 5 min break before dad said, "I'm going to carry this (box of heavy ceiling tile) down to the basement." Bill's response was "Don't fall." Mom, Mary and I just started laughing. It was so funny. But as you can see all that hard work has paid off. They got a lot done that weekend. Dad had Bill working hard all weekend long.